Is Your Company Everyday Inventive and Reinventive? While revolutionary ideas and quantum leaps get all the attention, "everyday inventive and reinventive" companies survive and thrive. Being everyday inventive and reinventive is not about creativity or patent applications; it's about basic good business -- everyday improvements, everyday progress, and great implementation. Far too many companies forget the basics. Little things actually mean a lot. Everyday inventive and reinventive companies achieve the greatest financial returns. They beget better products. They create sustainable value. Simplification, reinvention, change-ups, subtle pivots, improvising, initiative, and incremental continuous improvements can all drive value and long term growth. Change is a force of possibility. Adaptive companies outperform companies with non-adaptive cultures by a factor of 900 to 1 as measured by long term net income and stock price growth. Taking small steps every day can achieve big goals and sustain progress. Engage with them, collaborate with them, listen to them, build their trust and lifetime loyalty. Obsessively mine knowledge about your customers – even non-customers – until you develop broad and deep insights. Then give them what they don't yet know they need. Employees are as important (if not more important) than your customers. Great employee experiences drive great customer experiences. Diverse teams solve problems more creatively than homogeneous teams. Diversity delivers competitive advantage and encourages non-conventional thinking. Gender diversity, ethnic diversity, age diversity, diversity of experiences and perspective. In addition to promoting team diversity, you need knowledge of diversity issues in a global context. Think globally. Using what you've got in unexpected ways delivers surprise utility. Look beyond the obvious. Consider resurrecting ideas that were once tabled. What hasn't worked in the past may very well work now. Invite imagination, inspire questions, and reward/incentivize both success and failure. Encourage internal cross-functional collaboration, productive friction, good-spirited competition, and creative destruction – punishing only inaction. Open ethos cross-industry collaboration -- partnerships, alliances and coalitions -- can create favorable opportunities and sustainable advantage. Successful companies don't just reconstruct boundaries, they bridge them. Inject planning and discipline without locking into or mandating ridged processes and methodologies. By using agile/responsive approaches and flexible/adaptive frameworks, you inspire practical solution finding from the bottom ranks of the organization up. Be comfortable with uncertainty and adopt Darwinism when faced with risk. Track, monitor, and measure. Summarize progress. Then advance what adds value, discarding or tabling the rest. Don't go "all-in" on one idea. Sustained growth requires a balanced portfolio of strategies and the management capabilities to implement them. See a detailed explanation of RE:INVENTION's Ten Guiding Principles on RE:INVENTION's blog. Is your company's CHECK ENGINE light on? 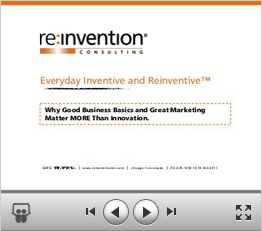 Is your company inventive and reinventive? Take RE:INVENTION's Diagnostic Test now! Is YOUR company everyday inventive and reinventive? RE:INVENTION's new Everyday Inventive and Reinventive Diagnostic Test calculates your company's capacity and propensity to innovate amid prevailing market forces. With just 15 simple questions, the test is a breeze to complete. We'll tally your score and give you a quick analysis. We'll also compare your company's performance with data sorted by industry, organization size, organization age, and geography. Quarterly checkups can track your company's innovation progress and culture shifts. First, please provide some general information so we can anonymously compare your results to those of similar companies. Answer the two questions below then click "next" for the next set of questions. You can go back to review your answers at any time until you click "GET YOUR SCORE" at the end of the test. 1 Why does your company want to innovate? 2 Does your company support diversity? 3 Does your company have an innovation champion or champions? 4 Does your company have top-level management support for organizational innovation? 5 Does your company have a budget for innovation? 6 Does your company have an employee feedback process? 7 Does your company encourage/reward innovation and inventiveness? 8 Has your company successfully introduced, reinvented, or evolved products, services, and processes in the past two years? 9 Does your company currently have a variety of new products, services, and processes under development? 10 Does your company conduct employee training, brainstorming, and/or simulation activities? 11 Does your company participate in and capture customer-driven innovation via crowdsourcing, crowd-solving, consumer research, or social media? 12 Is your company's intellectual property well-protected? 13 Does your company regularly use innovation tools? Yes - we use formal third party vendor tools like Spigit, Innosight, etc. 14 Does your company collaborate with external partners or vendors? 15 Does your company regularly measure and review progress, accept failure, and learn from both successes and mistakes? Yes - we regularly track progress, analyze results, discuss and review those results with employees, and make structured improvements based on the findings. Failure allows us to learn and grow. Somewhat - we track progress informally and look for ways to improve. RE:INVENTION's Innovation and Inventiveness Footprinting, Blueprinting and Implementation Services™ can help elevate your company's diagnostic test score and level of success. CLICK HERE to learn more. For over a decade, ­RE:INVENTION (www.reinventioninc.com), a market intelligence and innovation consulting firm, has jump-started growth and sparked a culture of transformation for over 60 clients, from Fortune 500 leaders to mid-size ventures and startups. Using our Everyday Inventive and Reinventive Diagnostic Test™, 12 C's of Commercialization Guide™ and Interactive Business Blueprinting Matrix™, RE:INVENTION has helped companies invent and launch over 40 new products and ventures and reinvent underperforming brands and operations. Meet our team of change agents, led by RE:INVENTION president and founder, Kirsten Osolind. Need more inspiration? CLICK HERE for 100+ free inventive and reinventive business tips you can put to use today. Copyright ©2002 - 2013 RE:INVENTION, inc. All rights reserved.